The objective of this project is to reduce health inequalities in Europe through an exhaustive mapping of all innovative treatments and devices available in member countries in Europe as concerns IBD care. The outcomes will support the exchange of knowledge and experience among EFCCA members, promote a better understanding of European healthcare systems, improve the mobility of people with IBD in European countries and facilitate access to treatment in other countries. The project pilot phase involves a first group of EFCCA members and will close in 2016. The second phase will be developed in 2017. The final report of our "Mapping of innovative medicines and devices in EFCCA member countries" is now available for download. 31 countries (including 32 patient associations) from the EFCCA network participated in this project between October 2016 and December 2017. The results show existing health inequalities between member countries and regions on issues such as healthcare systems, reimbursement policies and access to treatment. EFCCA and its members will work on these results to prepare for advocacy and awareness raising actions vis-à-vis the European institutions as well as on the national and regional level. The interim report of the “ EU mapping –innovative medicines’ project shows the first results from the pilot phase. The project aims to reduce health inequalities in Europe by carrying out a thorough mapping of all innovative treatments and devices that are available in EFCCA member countries. Countries involved in the pilot phase were: Finland, France, New Zealand, Poland, Serbia, Slovenia and Spain. To download the interim report click here. 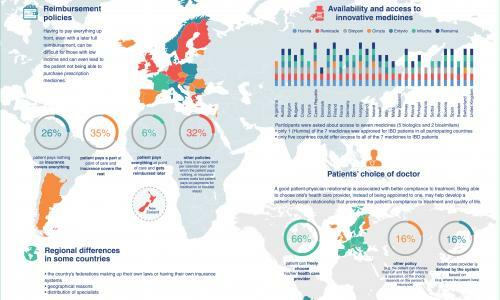 National health systems and access to various treatments tend to be unequal in different EFCCA member countries across Europe, in particular when dealing with new/innovative treatments and devices. In some of EFCCA’s member countries, there are no national registers of IBD patients available that would assist in obtaining information about IBD patients. The information of available new innovative treatments and devices (biologics, biosimilars, apheresis, nutrition etc.) and access to them in participating countries will be collected with the help of a work sheet. The work sheet will be developed and the project coordinated from within EFCCA by a working group, who will liaise with contact persons within participating countries. At first, a pilot group of countries will be involved, after which the other EFCCA member countries will participate step by step. The final product will be a general overview of national situations will be created, including the level of involvement of different payers and the role of national health authorities. For more information please contact the EFCCA office. No decision about us without us! On 15th November 2016, more than 70 patient advocates and physicians from across the European Union attended the Patient Advocacy and Safety conference at the European Parliament in Brussels, Belgium.